A sign of the times. 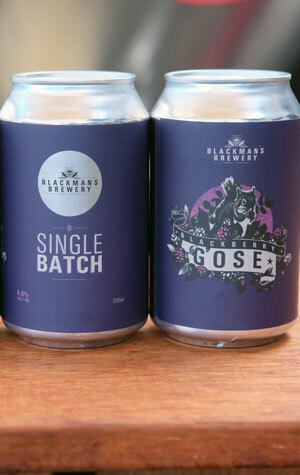 We received an email from Blackman's Brewery informing us they were releasing a new summer seasonal: a blackberry gose. It was to be tapped at their two venues and at the Ballarat Beer Festival on the coming Saturday. "Perfect," we thought, as we'd be passing by the brewery in Torquay on launch day so could taste at source before putting together the tasting notes. They'd canned some too – ideal for the campsite later that evening. One problem: by the time we rocked up to the bar, less than six hours after it opened for the day, all the cans had been sold. Yes, a brewery on the Surf Coast sold out of its entire canned stock of a salty fruit sour in a few hours. Blimey. Thankfully, there was still plenty on tap (and cans and kegs will be hitting good beer outlets around the country too). Plenty of a beer they gently soured and to which was added sea salt from the Torquay beach and 40kg of blackberries from local farmer, Ravens Farm Creek. It's a beer that hits the spot just right when you've wandered in from said beach: hazy and peachy hued, the blackberries shine throughout, the effect of the souring is more tart than puckering and the salt adds a touch more refreshment at the end. What's more, they had plenty of Reg IPA cans for the campsite anyway. UPDATE: Upon returning to the brewery for more draught gose, we learnt they're canning more.